Hello everyone, my name is Woody and I’m a rivet counter. Before we get started, a little more about myself. I started building models “seriously” in the late 80s, but building a business doesn’t leave time for much else so the last time I actually finished one was back in 1996. Keeping in mind that I’m now 72 with cataracts developing (surgery is scheduled) and hands that are slowly turning into boxing gloves - onto the build. 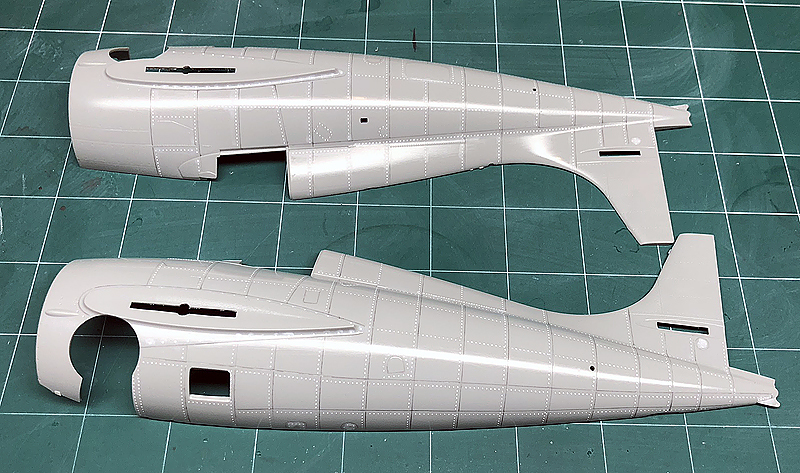 The Wildcat would never have been something I would choose to build, but in the course of developing our line of aircraft rivet sets I figured it would be a good choice for no other reason than it’s small. My opinion of the F4F was probably typical of what most people who know little about them thought, but after I started researching the plane my opinion changed considerably. That fighter, and the pilots who flew them during the darkest days of WWII proved to be up to the task of holding the line until the Corsairs and Hellcats became operational. The Wildcat’s contribution to victory in the Pacific may be a footnote but it’s a BIG footnote. I always start with the engine and promptly screwed up my first attempt so bad I had to buy another kit, which is usually the case for me - for that very reason. Regardless, I got that together without any major disasters and even wired it with .010” lead wire used for wrapping fishing lures and stuck one of our generic placards (not visible in this picture) on the case. Exhaust is Ammo Track Wash over AK Extreme Metal Steel. Not sure about the gloss black…. things like this happen when you use “restored” aircraft pictures for reference. Having survived that, it was on to the cockpit and wheel well. 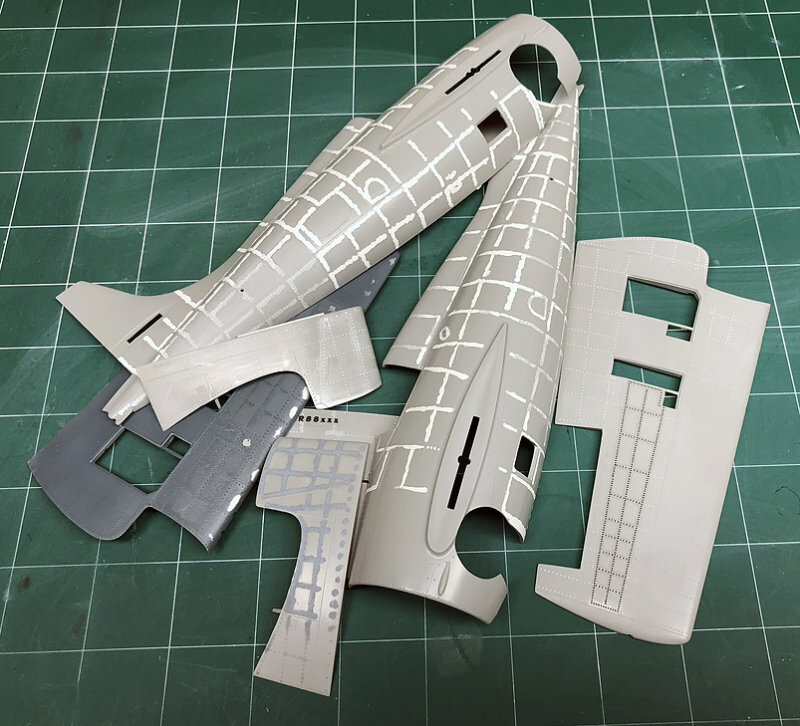 Since I had already gone off my original intent of building OOTB by wiring the engine I decided to make a set of cockpit placards and instruments which we now sell. I guess it turned out okay especially since almost none of this is visible once installed, but I developed a serious dislike of acrylics in the process. I’ve always used enamels and found out the hard way that my technique for chipping and weathering simply doesn’t work with acrylics. Okay, lesson learned and more on that later. 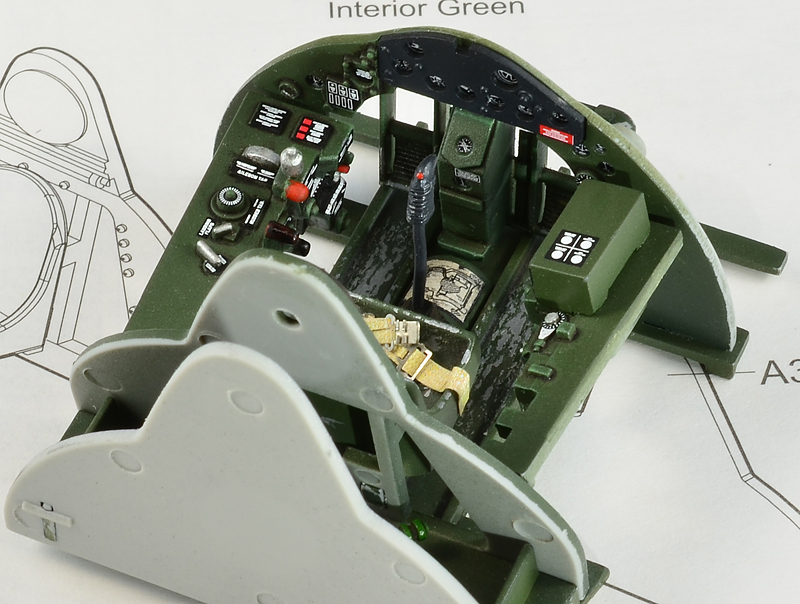 Ignore that "interior green" on the instruction sheet, the correct color is bronze green. Then it was on to riveting the fuselage. First order of business was filling the recessed kit rivets which slowed down my progress considerably. At first my plan was to use diluted Tamiya putty. Thinking this would be quick and easy I thinned it out and filled every rivet hole. I was feeling pretty sure of myself until I started sanding and realized no one in their right mind could ever suffer through this mind numbing process. I had to find a better way so it was back to the “lab” where I came up with a way to fill the kit rivets with minimal to no sanding. 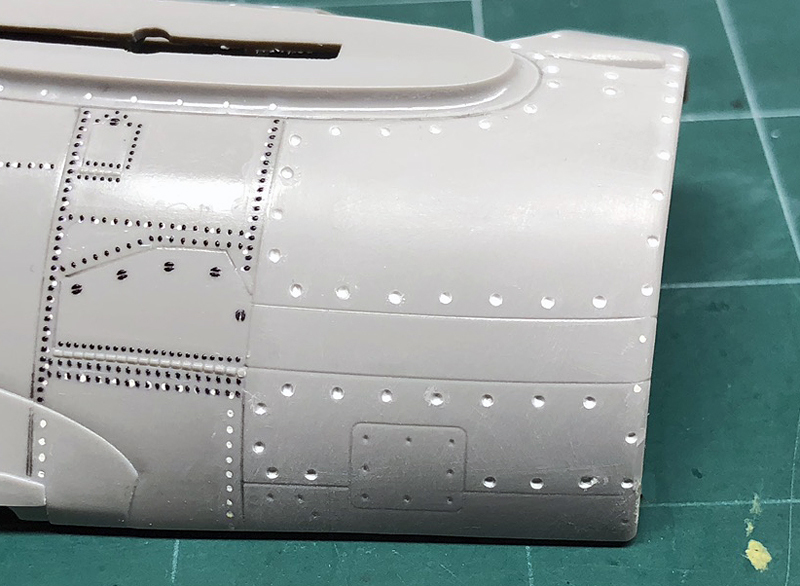 For the sake of brevity, I’m not going to go into details on the process of making the filler or the actual process of filling the kit rivets here - it’s all outlined in our manual which you can download HERE. You have to break eggs if you want to make an omelette. Some tests. 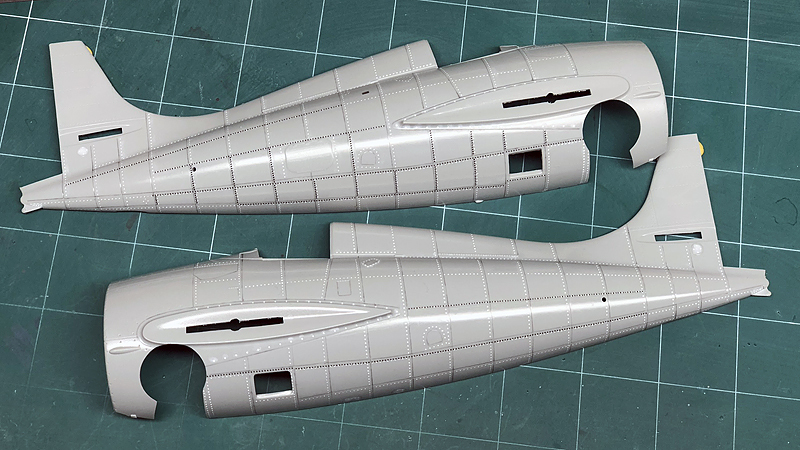 With the kit rivets filled in I highlighted the panel lines with a #2 pencil sharpened to a chisel point. This is a great help getting the rivets on straight and an even distance from the panel lines. Once that was done I shot a coat of Aqua Gloss over the parts, but I’m not sure this is entirely necessary. 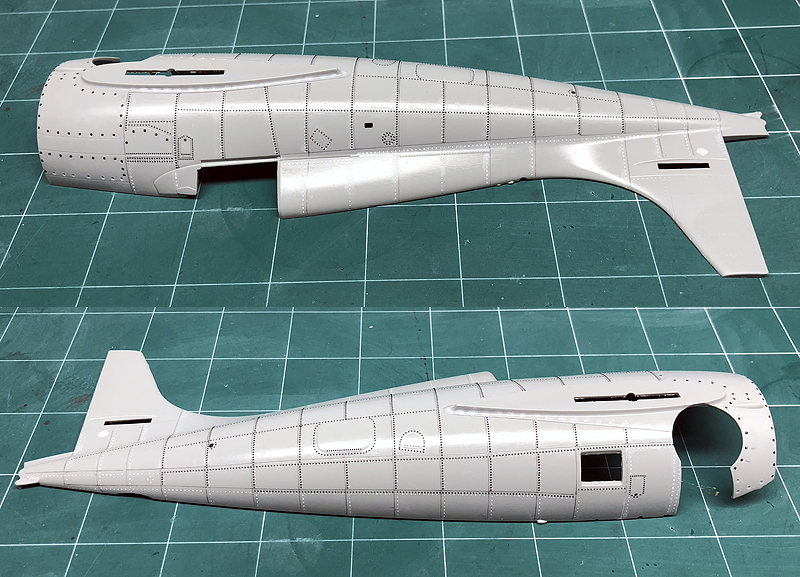 Kit rivets filled and panel lines highlighted. At this point I figured that it would be a lot easier to rivet the kit parts prior to assembly leaving off the ones where I would be sanding. 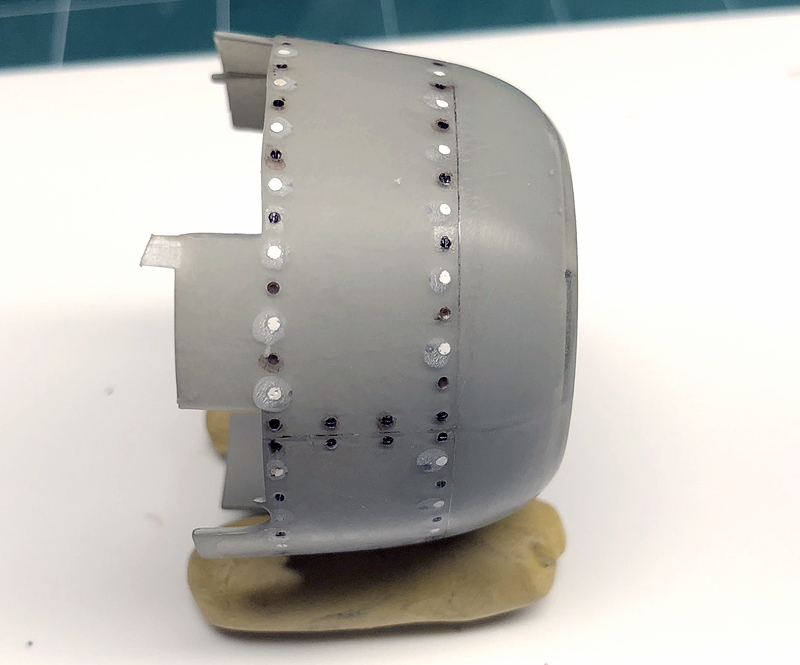 As of this writing I don’t know if this is a good idea or not, but I can honestly tell you that during the entire process the rivets never gave any hint of coming off. I also learned about Gunze Mr. Mark Setter… this stuff is outstanding because it has adhesive properties. To avoid having to keep it mixed by shaking it frequently I just put some in a paint palette. You don’t need much; I use a micro brush to put a series of small drops along where the rivets will go to keep it from puddling and running. As for setting solutions, I use MicroSol, Solvaset and Mr. Mark Softer and can see no obvious difference between them. Don’t be stingy with the setting solution - slather it on. 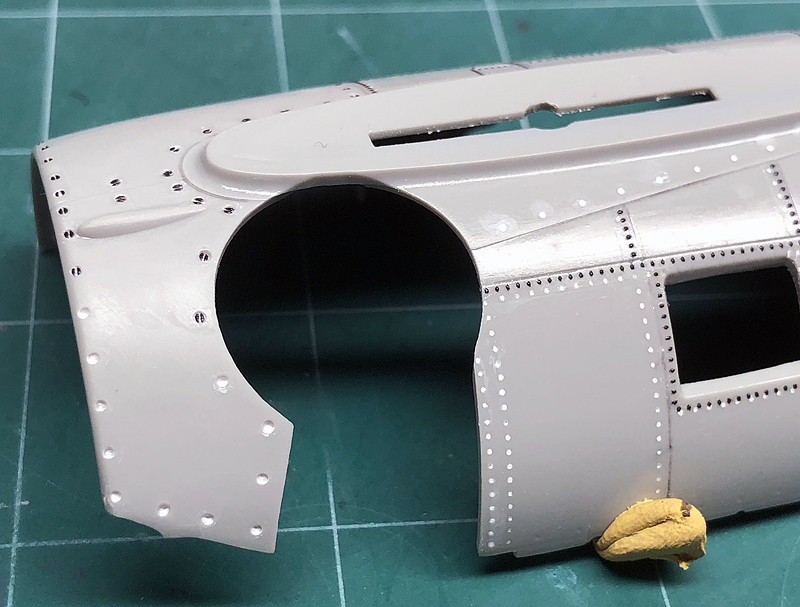 I started at the bottom of the fuselage halves to get the feel of working with the rivets figuring these would least likely to be seen and by the time I got to the more visible areas my skills would have improved, which they did. 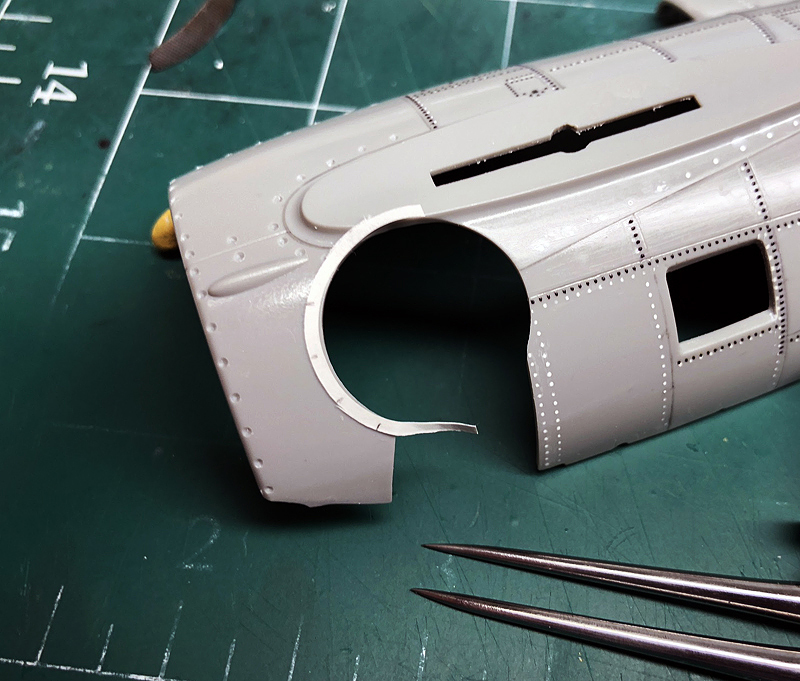 Frankly, applying the rivets is surprisingly easy - much easier than working with PE. Yea, it’s tedious as hell but other than that it’s just a matter of time. Call it therapy. Again, for the sake of brevity here, detailed rivet application instructions are in the manual which you can download HERE. I started with the longest continuous runs and I think that works best. After I had all those laid in I filled in the gaps with individual pieces rather than long pieces over the others which would result in rivets on top of rivets and irregular spacings at the intersections. 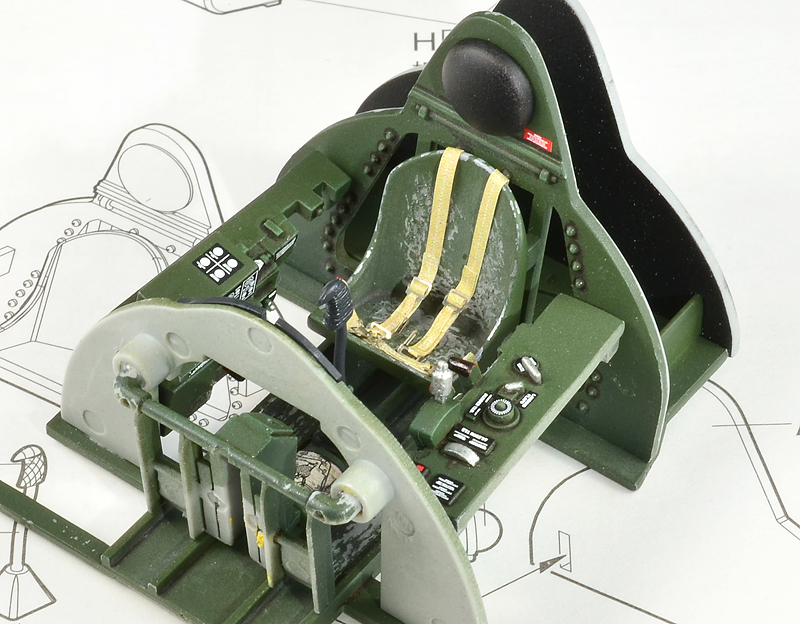 I also ignored much of the kit rivet placement for several reasons too technical to get into here. Let’s just say that my four years in the USAF as an Airframe Repairman is a curse. We can stop here for now so if you have comments or questions we can deal with those before proceeding. Great start on your build! Can you handle the plane for the rest of the build without losing rivets? They seem a little fragile in my eyes. A word of caution, be careful with the wheel wells when fitting the firewall (i hope that is the correct name). A lot of dryfitting is required because the wheel wells don't fit and have to be sanded a lot. At least that happend with my build of the wildcat. After all the handling not one came off. Unless you pick at them with your fingernail or something else they're not going anywhere. 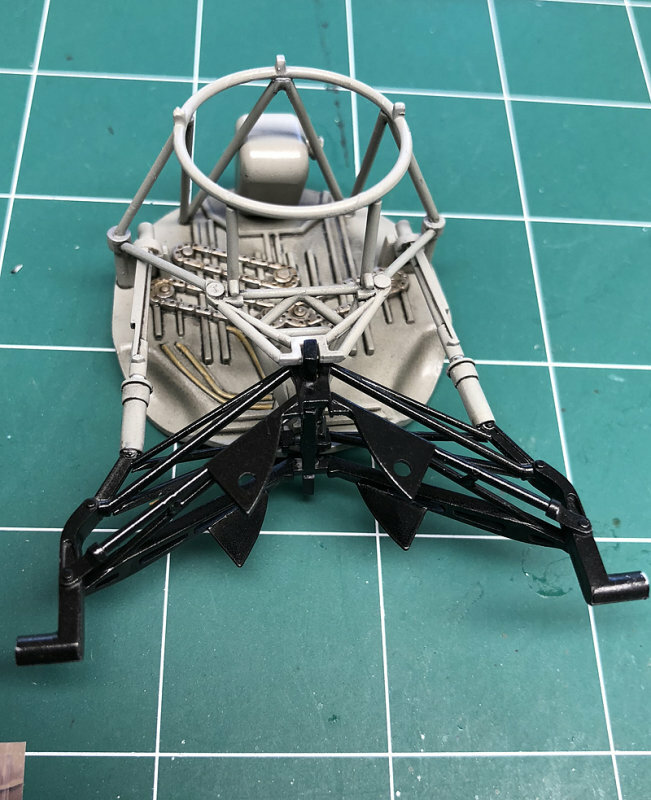 I'm aware of the wheel well alignment issue and both the cockpit and wheel well has been test fitted and will be checked before gluing. Great to see you here Woody... And thanks for such a great product! 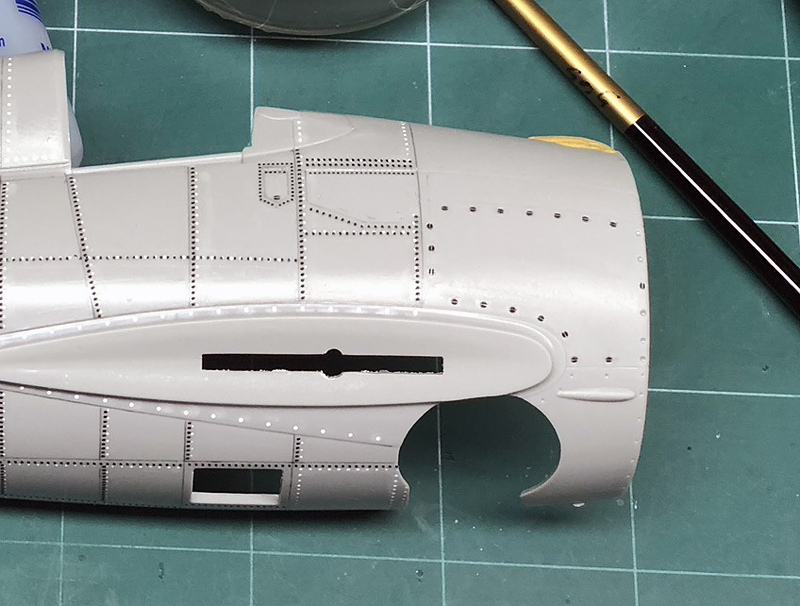 Loving what you are doing here and a great help for me with my 24th Mosquito and 32nd RNZAF Skyhawk builds as I am using your products on both. Have you considered some 1/2 rounds to simulate airframe weld seams? I know you do some welds but often on aircraft in 32nd etc they present as a fairly smooth 1/2 round and not as industrial as used in armor? Just a thought and keep up the awesome work! The alignment issue is actually the firewall. You have to shave and trim the top. It seems if you follow the instructions the firewall is placed in a wrong angle. 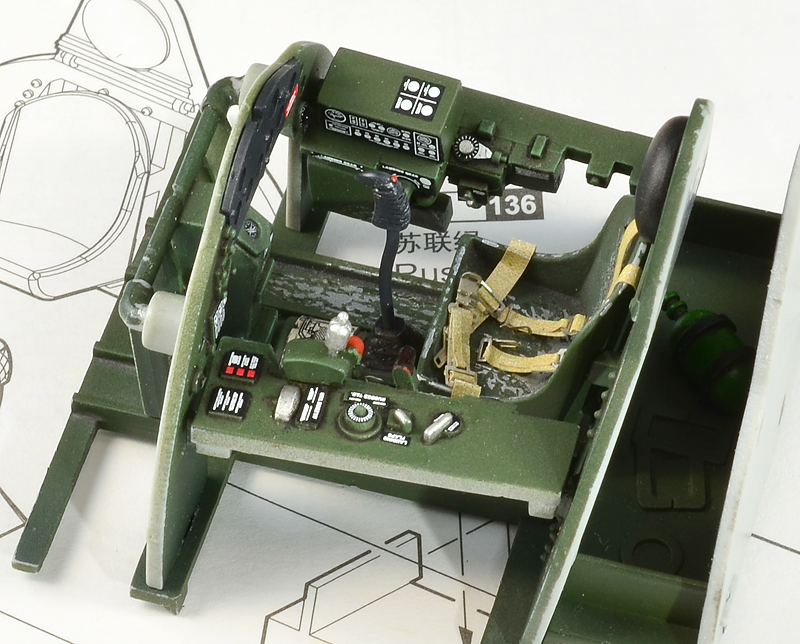 I believe the reason for this was when the first issue wildcat was corrected, they corrected the fuselage, wings, canopy, but not all the interior. I read a couple build reviews before I started and made sure the alignment was correct. 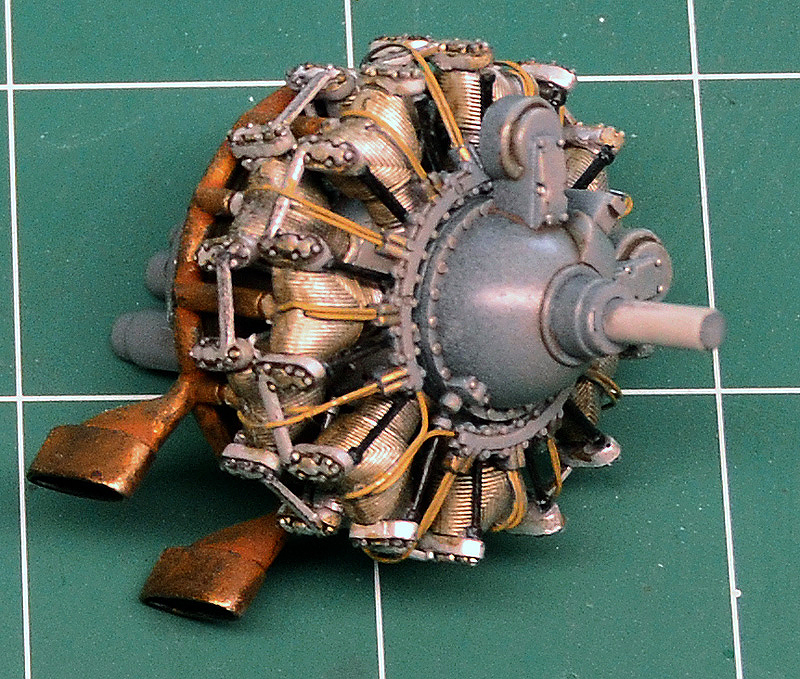 The way the landing gear is mounted to a circular assembly is a recipe for disaster. Basic assembly before anything else. Email me at help@archertransfers.com so we can discuss this. Thanks Woody! I will email soon. Originally I was going to build it OOTB with rivets but it turned into a “I wonder what would happen if I did this?” build and then it became a test mule for some of our products. Since we have Dzus fasteners I decided to upgrade the kit’s poorly represented cowl fasteners. How ever they decided to just represent them with holes instead of the excellent ones on the gun access (despite so many are missing) I decided to “fix” that too. Just filling the kit holes and laying the fasteners on top of the skin isn’t going to help so I used a .035” (#65) drill to open the kit locations up to the diameter of our Dzus fasteners so they would sit flush with the skin. In reality these fasteners do not appear flush like flush riveting, but rather have a somewhat distinct recess around them which is the result of the skin being “dimpled” for more bearing surface than if it had been countersunk. First I drilled down just far enough to open the kit hole up to the diameter of the drill. Do not drill deeper, you just want the surface to be the diameter of the drill. Next I put a tiny drop of Tamiya Extra Thin in the hole to soften the plastic just enough to take the sharp edge of the hole off, creating a slight radius. At this point I would suggest applying a white wash into the holes to help aligning the fasteners correctly. 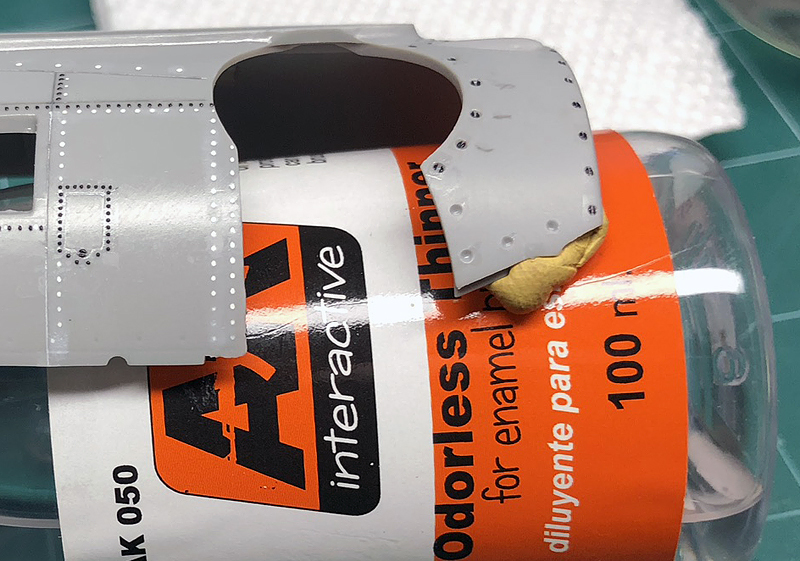 When applying the fasteners, I first put a small drop of Mr. MarkSetter in the hole, maneuvered the fastener into position and then used a couple coats of Solvaset to get the clear film to bond to the plastic. Setting solutions soften the film to a jelly-like consistency and becomes a coat of clear lacquer. 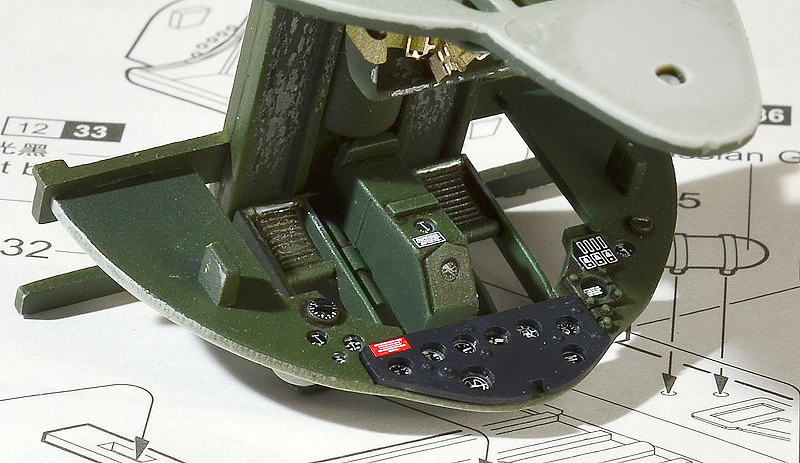 I then applied each fastener individually doing my best to keep the slots parallel to the panel line. I made a little tool from a cocktail stick and a pin to align and rotate the fasteners, a task not easily accomplished. I had to add some here and used dividers to mark off the locations. All except one is what I’m working to get. The second from the bottom right is in too far. Helps to have the area somewhat level so the setting solution doesn’t run down the side. I did this side first and found out a white wash would make locating the fasteners easier on my old eyes. Way too many fasteners on the kit cowling so I filled every other one. Even at that, there are over 90 fasteners in the nose cowl alone. I have no idea how all this is going to look painted but it’s been interesting so far. That's incredible....I might have to rethink my fasteners on my Mosquito after seeing this. I have that sheet already I think. Wow. I’d really like to try this on my F3F. Good show so far Woody! Thanks for the updates. Will be following this thread. Nice work!